The Nobel Assembly awarded this year’s Nobel Prize in Medicine to Elizabeth H. Blackburn, Jack W. Szostak, and Carol W. Greider for the discovery of how chromosomes are protected by telomeres and the enzyme telomerase. With their ingenious genetic research and meticulous biochemical studies, they not only solved a fundamental problem in biology but also opened a new field of research and initiated the development of potential therapies against disease. From early on in genetic research, it had been evident that structures at the end of chromosomes had a protective role, although their exact molecular nature remained unknown. After the structure of the DNA was first described and DNA polymerase was discovered, it remained unclear how complete synthesis of the ends of linear eukaryotic DNA could be achieved (dubbed the “end-replication problem”). In the late 1970s Elizabeth Blackburn was working on linear DNA encoding ribosomal RNA (rDNA) in the unicellular model organism Tetrahymena thermophila and determined the end- sequence of rDNA molecules: a variable number of tandem repeats of the hexanucleotide CCCCAA. At the time, Jack Szostak was studying the mechanisms underlying homologous recombination in yeast and was especially interested in constructing artificial yeast chromosomes. In 1980, the two researchers set out to investigate whether Tetrahymena chromosome end-repeat sequences added to a linear yeast plasmid would stabilize the ends to allow recombination. And indeed, the evolutionary conserved functional properties of Tetrahymena rDNA end-sequences provided chromosomal stability in yeast. They were also able to isolate functionally similar sequences in yeast and deduced that those end sequences corresponded to functional telomeres. Carol Greider, together with Blackburn, then developed an assay using Tetrahymena cell extract and a synthetic DNA oligonucleotide (TTGGGG)4. She showed the presence of enzymatic activity in vitro and subsequently described this enzyme as a ribonucleoprotein complex critically dependent on both a protein and a RNA component: the telomerase. Greider and Blackburn later reported that telomerase contained an RNA component with the sequence CAACCCCAA that possibly acted as an internal template for the synthesis of TTGGGG repeats. 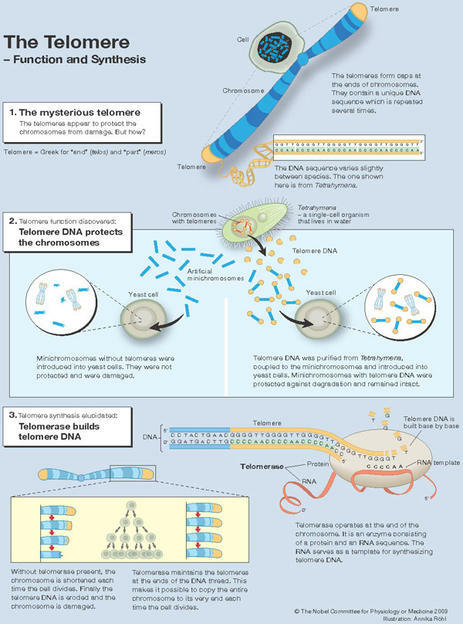 Thus, the key features of the telomerase enzyme – a catalytic protein component plus an intrinsic RNA template – had been elucidated and the basic mechanism of telomere synthesis and maintenance was established. 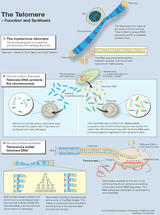 Further research showed that telomere maintenance is crucial for genome stability and cell viability. The medical implications of these discoveries were soon apparent. Many cancer cell lines show abnormal telomeres and an increased telomerase activity. Numerous therapeutic strategies targeting telomerase have since been developed, and a number of clinical trials are underway. Telomerase deficiency is also linked to hereditary disease syndromes, most of them showing germ-line mutations in the genes coding for subunits of the telomerase enzyme complex. Moreover, maintenance of telomere length and protection are crucial factors in the control of the life span of cells. The link between aging and both telomerase activity and ­telomere length, however, is not straightforward, and cellular aging is a complex process influenced by many different factors. To this date, research in the field remains intense.